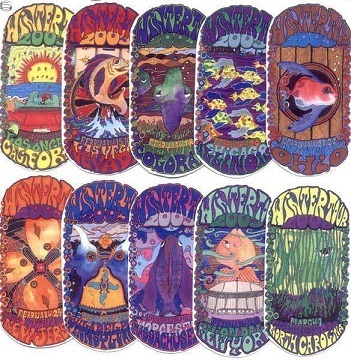 Limited edition 2003 Phish WinterTour poster set that was designed by New Hampshire native and Phish fan Ryan Kerrigan. This is a limited edition numbered set of 100 and each 9" x 17" full color poster is signed in silver metallic ink by Ryan Kerrigan. Frame them together or individually. You get 10 different posters. 1 for each stop on their 2003 winter tour.